After our first launch in 2012, and then a week or so at the dock getting things in order, a friend and I took the boat for its first sail, for a few hours in the Connecticut River. This was lovely. As we went along, we noticed a little bit of sticking when the tiller was all the way over, but at first it was mild. Then there was one of those moments when you really, really wish the boat would turn more than it is, and the tiller was put over solidly to one side. There it stayed. We thought maybe a stick from the river had become jammed, and we spent some time fussing with a boat hook, reaching over to try to clear whatever was going on. This problem of sticks, or who knows whatever else, jamming in the rudder is one of the big reasons why an easily accessible transom-hung rudder is preferable (for me anyhow) – the underneath rudder is the only thing about the Glasshouse Chebacco design that I have wished, from the beginning, was different. Anyway, there we were. We had launched the boat on April 20, and the river was still quite cold, so neither of us was in any hurry to jump in. We made many tries at the tiller, but felt that further force was more likely to break something than to resolve the problem. Shortly after the rudder first jammed, and we started sailing in uncontrollable circles, we had put down the anchor and lowered the mainsail. We were already in back of a small island in the river, so it was a great spot to stop and consider, held by the anchor and thus avoiding problems from the current. When it became clear that we could not get the rudder unstuck, we furled the mizzen sail and resorted to the motor. 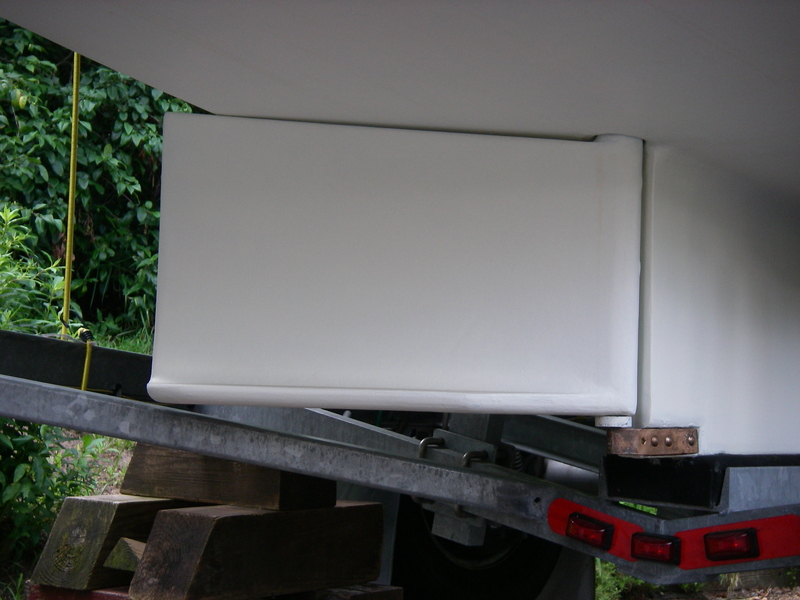 With the electric Torqeedo on the back of the boat, steering by turning the motor sharply to one side, it was possible to overpower the stuck rudder and to steer the boat in a relatively straight line. Back we went to the dock, which was fortunately not terribly far away, at about a half a mile. Tom Potter, the builder of the boat, kindly made a trek a couple of days later, from Narragansett Bay to Deep River, Connecticut, to figure it all out. We took the boat around the corner to the boat ramp, steering with the motor once again overpowering the rudder, and in he waded (in April! ), tools in hand. Fortunately the giant crowbar was not necessary. But it did take some good, solid pulls on the rudder itself to get it unstuck. There were no foreign objects… the rudder was simply jammed against the slope of the hull. This particular incident resolved just fine, but it sure wasn’t something that I wanted to have happen again at a bad moment. Before final departure from that dock we added some pieces of wood, screwed down to the cockpit sole to make a stop, so the rudder could no longer turn far enough to get stuck against the hull. Conveniently, the original arrangement at the top of the stock included a seized on wooden piece, that was originally there to support the tiller at the correct angle for the autopilot. This provided something for those additional pieces of wood to bear against, to limit the rudder’s swing. This entire “stop” arrangement is the bit that has needed to be redone, since the recent changes to the stock/tiller connection have made the earlier system unworkable. An alternative to this stop arrangement in the cockpit would be fastening shaped wood pieces to the underside of the hull, on either side, that the rudder itself would bump against without sticking. However, that approach has its own complications: drag while sailing, bottom-painting obstacles, and being hard to check underway, as well as requiring drilling holes in a perfectly good, waterproof hull. I haven’t been so excited about that idea. 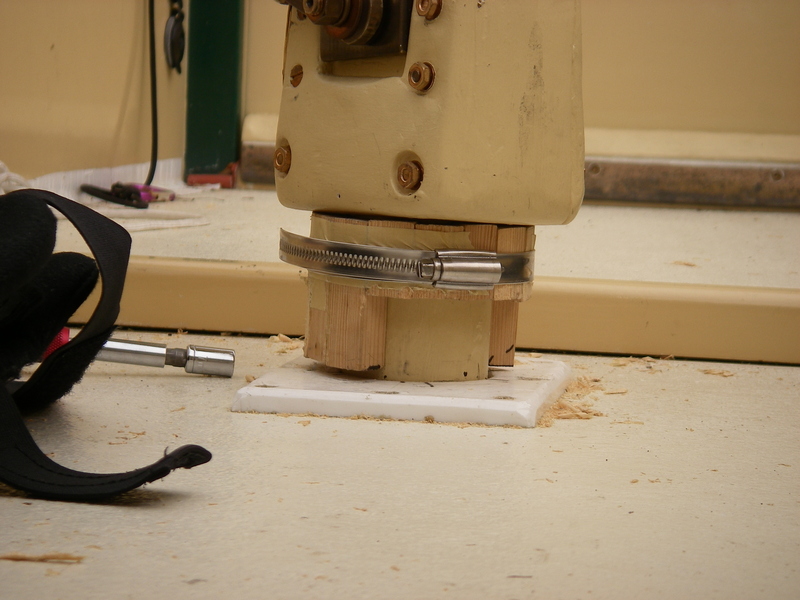 On the other hand, the cockpit rudder stop arrangement is complicated because of the question of how to fasten the wood piece that goes onto the stock, without drilling holes in the stock. 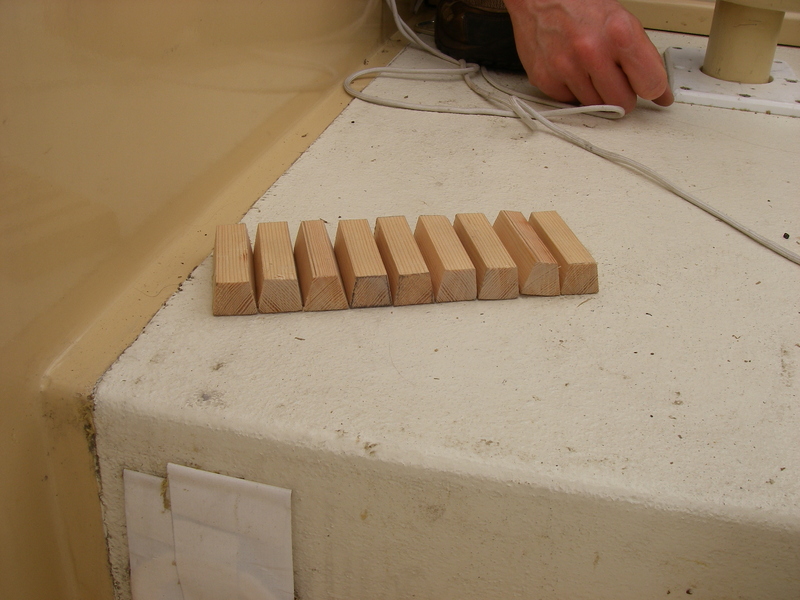 Because of the strain on the wooden stock when sailing, I’m unwilling to take the chance of weakening it with significant holes, especially for bolts that would be heavy enough to secure the stop (my apologies for these words that are so similar). In the previous version, there was the longer stop, caulked and lashed to the stock with seizing, with a tiny pair of pins to prevent slipping. 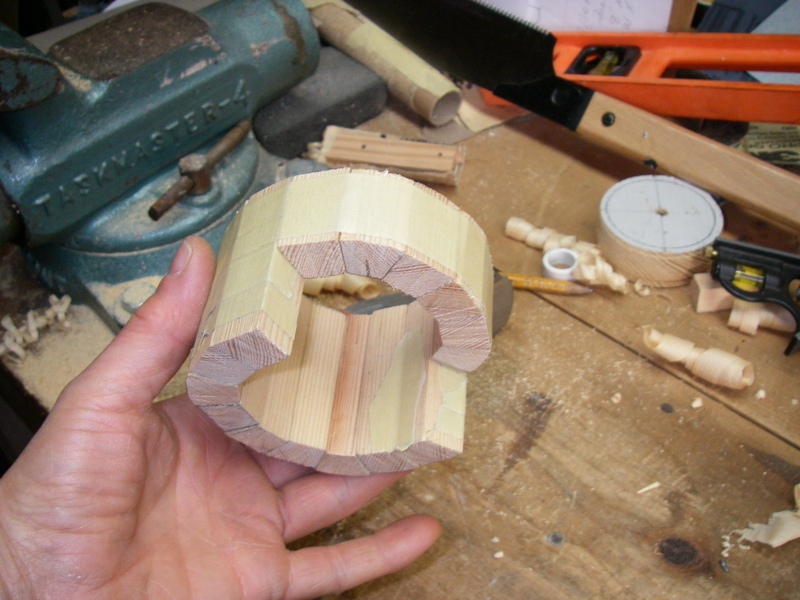 Now, with the tiller clamp in place, there’s not enough room to feel like the same thing would work – the stop block would be too short, and likely to twist. The cutout area, on the lower half of the “barrel,” is the section that will swing above the comparatively smaller, wedge-shaped stop that will be screwed down to the cockpit sole. The intact part of the lower barrel will, in theory, be sturdy enough to prevent the rudder from swinging beyond the point where the barrel contacts the wedge. This will stop the whole works at a point where the rudder is a comfortable margin short of being able to jam against the hull. Presently, the barrel section is in the paint shop. 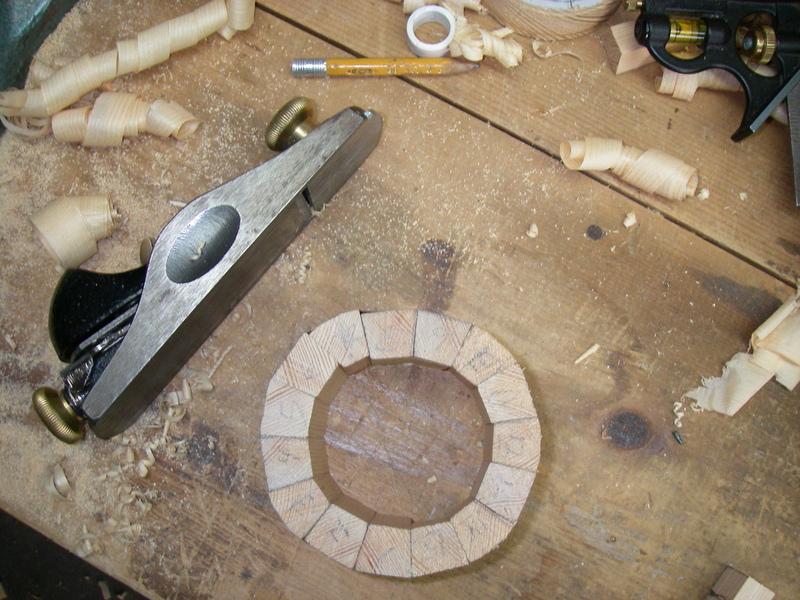 Next week it will be clamped/wired, with dolfinite, to the stock, and then the wedge piece can get sorted out. In the meantime, the various other projects will be getting their turns: drogue storage, the new mainmast, and further work on rigging the sails.